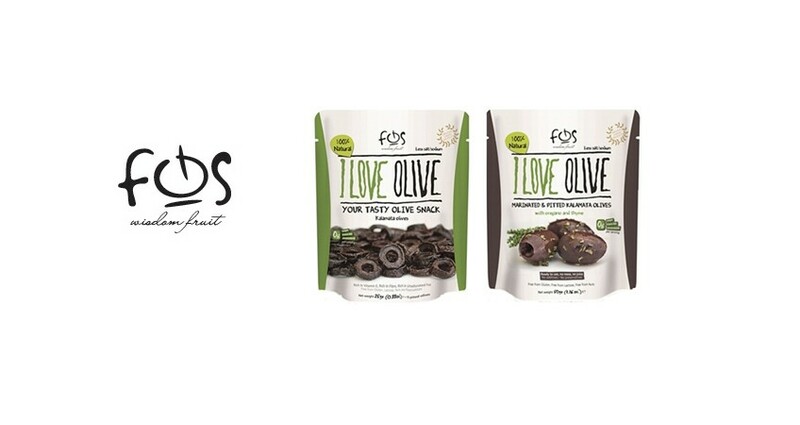 FOS brand, inspired by authentic Greek cuisine, presents a product that revolutionizes the olive industry. Visit our stand H032 in Hall 11.2 at Anuga 2013 from 5th to 9th October 2013 in Cologne Germany, to experience the taste and benefits of this amazing product in person! FOS – “I love olives” are Original Greek Kalamata olives, cured in sea salt brine, and processed in a delicate way that fully preserve their taste and nutritional value. Unlike other olives they have been sliced and dried and literally transformed into tasty crispy wheels. The amazing thing is that this 100% natural product is not only extremely tasty but it constitutes a major source of good fats (unsaturated). The consumption of 2 snack packs provides you with the daily intake of all the good fat you need to contribute to the maintenance of your normal cholesterol levels in the context of a balanced diet and healthy life-style. All the above make us the ideal snack for everyone and for every hour of the day; in the office, at school on a trek or in a bar with your drink.